It is a bitter truth that there is no escape from tax. Sooner or later you have to pay tax or carry out tax planning. If you delay tax planning you may end up selecting wrong tax saving instrument which leads to disaster. Let me share one real-life story with you. Last year in the month of March my friend was looking for tax saving option. One LIC agent approached him and explained about the benefit of “LIC Jeevan Saral Policy”. LIC agent claimed that LIC Jeevan Saral will give 14% return at the end of maturity. After discussion, he got convinced and purchased LIC Jeevan Saral Policy. Now he realized that investing in LIC Jeevan Saral for tax saving was the wrong decision as he may not get desired returns. Learning from above example is one should start tax planning at the beginning. One should not get influenced by the sales pitch of agents or so-called tax experts. FY 2017-18 is about to end. We are left with only one month for tax saving. Hopefully, you have completed your tax saving exercise and submitted Form-C to your employer. If you are yet to complete your tax saving exercise you have to act fast. In this post, I will be sharing 5 Best Tax Saving Options. 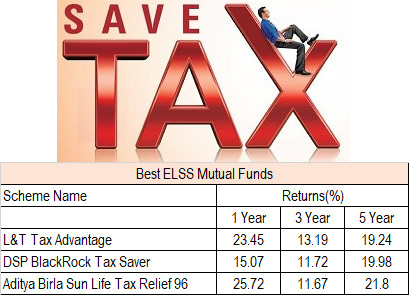 ELSS is one of the best tax saving investment option. ELSS are mutual funds which invest in equity and related instruments. ELSS comes with lock in period of 3 years. The investment in ELSS is very easy. Find out a best suitable ELSS tax saving scheme and invest in the scheme via fund house website or registered mutual fund agent/distributor. You need to select fund wisely. Carry out good research before investing in ELSS. If require take help from experts. Here are few best ELSS for investment in 2018. Health Insurance is next tax saving investment option. The cost of health is increasing. If you have yet not purchased health insurance for you and your family, you should buy health insurance. A premium paid on health insurance is exempted from tax. Health insurance can be purchased online with click of a button. You can avail tax benefit for the premium paid for family members including parents. Tax benefit on health insurance – Up to Rs 25,000 and Rs. 30,000 for parents (Senior citizen) under section 80 D.
The third best tax saving investment option is PPF or public provident fund. PPF is small saving scheme by the government. The maturity period of PPF is 15 years. PPF is best suited for investor with low risk taking capacity. The interest rate applicable on PPF account is declared by government time to time. Current rate of interest on PPF is 7.6%. Term Plan is next tax saving investment option. Buying term plan means purchasing financial security for your family. If you have not purchased a term plan or if you are underinsured, it is recommended to buy an online term plan. The premium of term plan is exempted from tax under section 80C. You can purchase term plan online. You should carryout research before buying a term plan. Last best tax saving option is tax saver FD. This option is suitable for the conservative investors. Tax saver FD is offered by a bank. The lock-in period for tax saver FD is 5 years. You can also purchase tax saver FD online. However, this option is offered by very few banks. 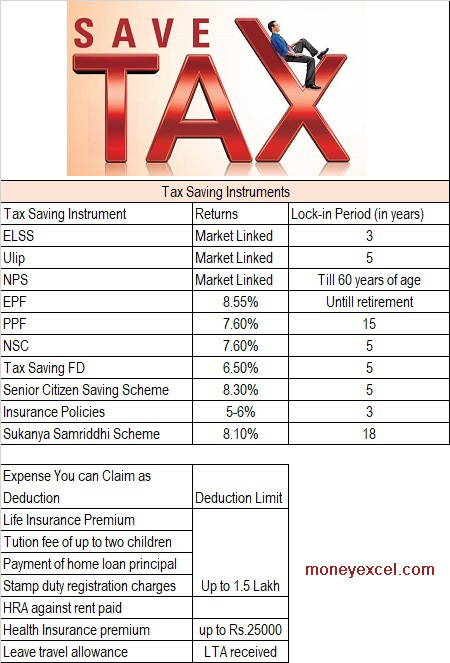 In order to help you here is chart showing various Tax saving instrument. I have also included returns and lock-in period of these instruments. I hope above tax saving options will help you while doing tax planning exercise.